Curious how airplanes get in and out of airports when there's no control tower? 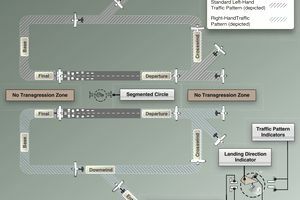 The short story is that they use a rectangular traffic pattern, entering and departing at common areas in the pattern and otherwise flying a predictable path through the air at a known altitude while making radio calls. That's it. It works, most of the time. Now, here's the longer version. Light aircraft are expected to fly a traffic pattern around an airport. At small, non-towered fields, airports are allowed to enter and depart pretty much however they'd like to. Technically, they can fly circles instead of rectangles, and they can fly to and from while doing barrel rolls if they so desire (except the FAA make take issue with that and invoke Part 91.13, which says that nobody can act in a way that endangers others). But there is a standard pattern that (most) pilots fly in and out of airports, and it's a rectangle with six different parts, or "legs." Direction: A standard traffic pattern is flown to the left, meaning the aircraft makes left turns in the pattern. Non-standard, or right-turn, patterns do exist to avoid terrain or obstacles, or for noise abatement procedures, but the standard pattern is to the left. Altitude: The pattern is flown at approximately 1,000 feet AGL, or above ground level, or at the recommended altitude found in the airport/facility directory published by the FAA. This altitude may vary depending on obstacle clearance, terrain, and noise abatement procedures. For an airport at sea level, the traffic pattern altitude would be 1,000 feet MSL. For an airport with an elevation of 5,500 feet, the traffic pattern altitude would be about 6,500 feet MSL (as read on the aircraft's altimeter). Airspeed: All pilots are required to comply with speed restrictions of not more than 200 knots in traffic patterns, and should adjust speed to match other aircraft in the pattern as able. The traffic pattern can be divided into 6 parts: The departure leg, crosswind leg, downwind leg, base leg, final, and upwind. About one-half mile away horizontal distance from the runway in use, the pilot should turn to the downwind leg, which parallels the runway and is flown opposite the landing direction. The aircraft will be heading "with the wind" or in the direction that the wind is blowing. The pilot flies the length of the runway at the specified pattern altitude and begins to configure for a landing, perhaps completing a "before landing" checklist, adding flaps and/or ensuring that the gear is down and locked during this phase. Abeam (90 degrees perpendicular to) the landing point, or the departure end of the runway on downwind, the pilot will likely reduce power and begin a gradual descent. At a position on downwind, beyond and at about a 45-degree point from the approach end of the runway, the pilot should begin a medium bank turn to the base leg, again perpendicular to the landing runway. The pilot continues his descent at a normal rate of descent while adding flaps if necessary. When at a 90-degree point from the landing runway, the pilot will turn to the final leg of the pattern. The final leg of the pattern should be spent finalizing the approach, taking note of the aircraft's configuration, airspeed, altitude, and descent rate. When on the appropriate glide path, the pilot will be at the recommended airspeed for the specific aircraft, descending at a moderate rate and in a normal position to land with flaps and gear extended as necessary. During the final leg of the pattern, the pilot descends all the way to the runway for landing. During the approach, many things can happen that can cause a pilot to go around or execute a "missed approach." Another aircraft on the runway, an unstable approach or the presence of wake turbulence can mean that a pilot will choose not to land, but will execute a missed approach or a go-around, in which case the pilot adds full (or takeoff) power, climbs away from the ground, and reconfigures the aircraft for the climb. During this time, the pilot should join the upwind part of the pattern, which is offset to the right side of the runway (for a standard left pattern) slightly. The upwind leg would then be flown until in a position to turn to the crosswind leg. The entry into a traffic pattern should, when possible, be made from a 45-degree point to the downwind leg, joining the downwind leg of the pattern around the mid-field point, or with at least enough time for the pilot to configure the aircraft for a normal approach. Departures from the pattern should, when possible, be flown from the departure or upwind leg, either straight out or at a 45-degree angle in the direction of the pattern on the crosswind leg. NOTE: These are guidelines only. Arrivals at non-towered airports often come from all directions, and departures often depart to any direction the pilot chooses. Care should be taken to remain vigilant in positively identifying traffic inbound and outbound in all cases. Exercise caution and make timely radio calls at all times.